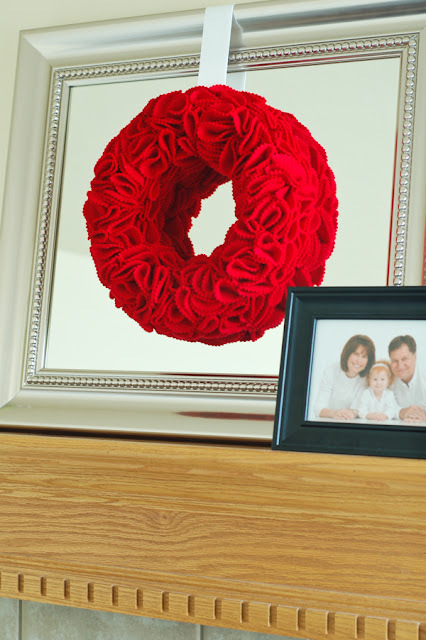 I saw this felt wreath on The Idea Room blog and loved it! I ran out and purchased the supplies and sat down to cut out a lot of 3" circles from felt. I couldn't wait until February to hang it, so it's on the mirror over the fireplace already. 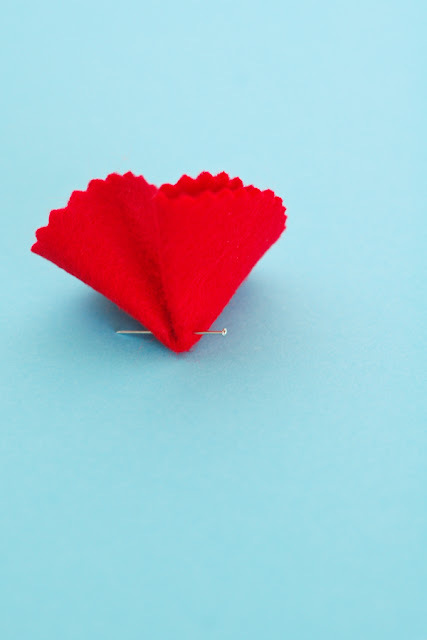 This project is super simple and doable and looks beautiful. I've gotten a lot of compliments on it. After my crafty girlfriends saw mine, we made them for craft group. Here's a quick tutorial of my version. I changed things up just a bit. I love anything with scalloped or pinked edges, so I cut my circles with pinking shears instead of regular scissors. I love, love, love the texture it adds. I used a 10" circle wreath so it would fit nicely on my mirror. Use an "extruded" form. It's more dense than the more hole-y styrofoam and the pins will stay in better. Definitely use a heavier-weight felt. It's more expensive, but well worth it. I found mine at Joanne's for $6.99 a yard. 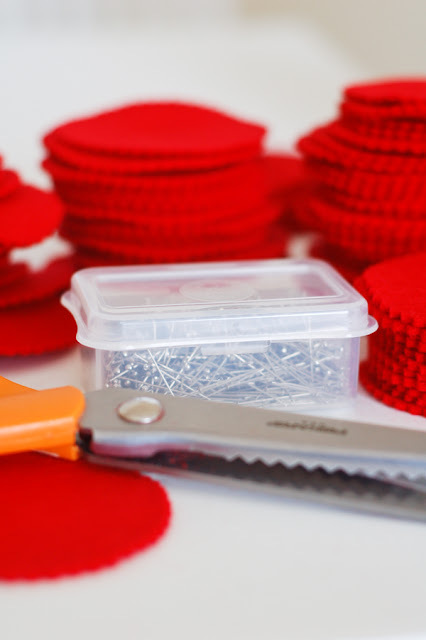 The lightweight felt will require you to use more, which means you'll need to cut and cut and cut more circles. The heavyweight felt also gives the wreath a more quality look. 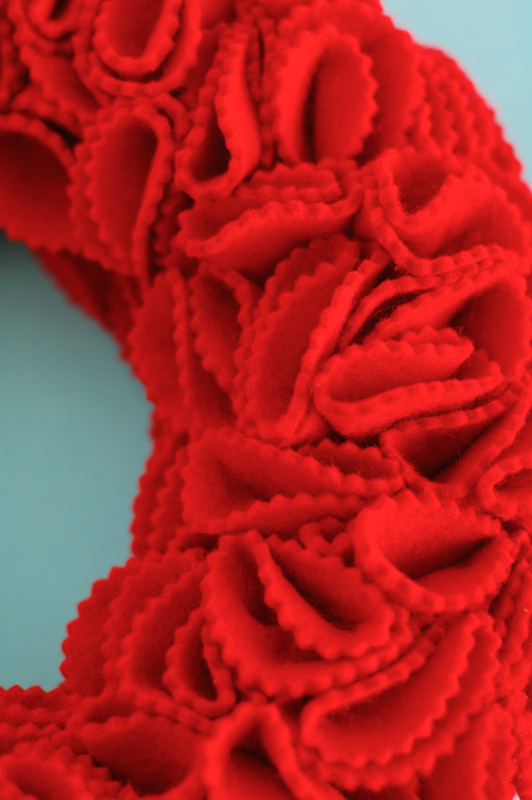 One yard of felt was enough for two 10" wreaths--one for you and another for a special someone. Or keep them both. I'm thinking ahead and making two of many projects I make this year so I have gifts for Christmas. If you plan to make only one, purchase about 2/3 yard because the last row of circles hits the center of a yard of fabric. I cut a template from chipboard and used a black fine tip marker to trace my circles onto the felt. (The top of a 15 oz. can is also the right size. Use the type of can opener that doesn't leave a sharp edge.) Cut right inside the line of each circle so no ink shows. A 10" wreath takes about 120 circles. I added another 25 on the back so the reflection on the mirror doesn't show the wreath form. My second wreath is 8" and I love it just as much. My friend Jen made the heart shape wreath and a ball to fit on top of a candle holder. She said it took almost the entire yard of felt. I used general purpose sewing pins--Dritz Dressmaker Pins Size 17 or 1 1/18" size. I used white grosgrain for Valentine's and will swap it out at Christmas for some gorgeous green vintage satin ribbon my friend Maggie gave me. Thanks again, Maggie! Step 1: Trace and cut three-inch circles from felt with pinking shears. Step 2: Fold felt circle in half, then in half again. Step 3: Pin through the bottom of the folded circle and push into the styrofoam wreath. Tip: I've seen other wreaths and projects made with this technique. One thing I really like is when the circles go in all directions instead of just one way. So push a circle into the wreath and then place the one next to in facing the opposite direction. You'll end up with a more paisley-ish design instead of a stacked one. It also makes the wreath look fuller. Step 5: Hang, enjoy and take compliments graciously. My uber-creative friend, Jen Ostler, made a Halloween version of the felt wreath for our Super Saturday RS meeting. Love it! 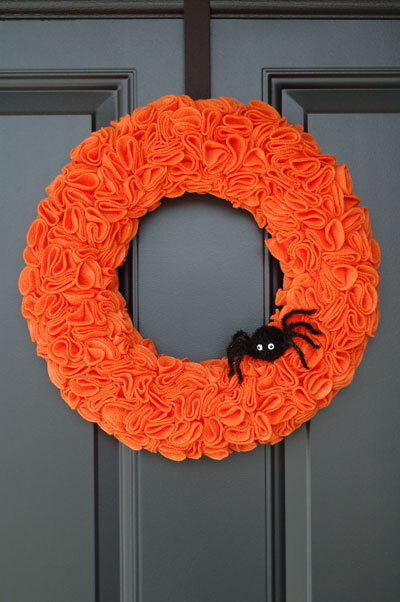 We couldn't find a heavier-weight orange felt and it took almost an entire yard for this 12" wreath. She found the spider at JoAnn's. It was actually part of a pick, she just clipped the wire and inserted it into the styrofoam. That is absolutely adorable and how simple can it be? Good job, girl! So cute! Thanks for the great tutorial. Stopping by to thank you for the tutorial. I am sharing your wreath tomorrow on my blog! LOVE your halloween wreath! Pinned it! 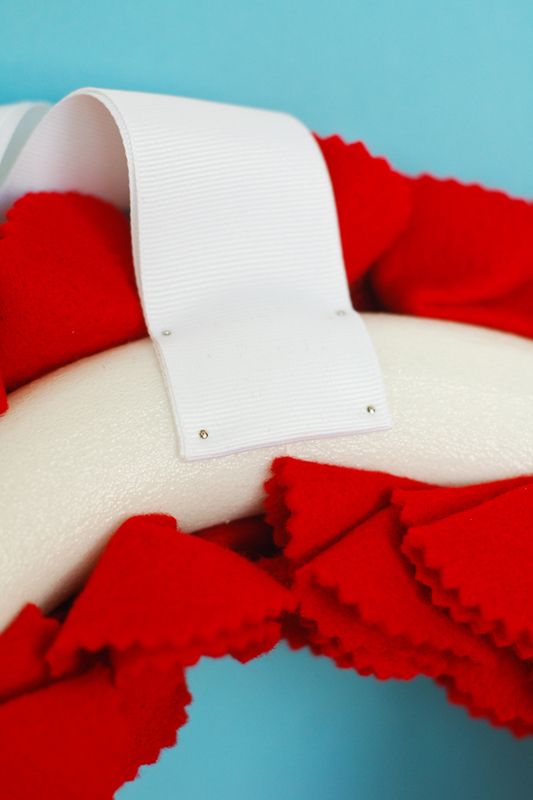 do you think it would work with fleece instead of felt? so cute! and is the orange wreath done with pinking shears as well? Jen used regular scissors on the orange wreath. It gives a more ruffle-y look. Love both ways. I tried it with fleece and love how it turned out. I did an 16" wreath and it took nearly 2 yards (about 500 circles) but its rather densely spaced. My circles are definitely more stacked than your pictures, so it came out as a swirly surreal texture rather than rosettes, but that was perfect for a Halloween wreath. I added a spider, letters to spell "boo" and a witch hat. It looks fantastic! Thanks for the idea! Lyndie, that's great! I love when you can take an idea and switch it up a bit to make it your own. Way to go! Could you cut them as squares instead of circles? I think it would give a totally different look, but very darling. It would be way easier to cut squares vs. circles too! Good thinking. Looks like ward like your project mmch i made one in blue and white. I pinned mine close to gather for more of a ruffle look tooko 360 3" circles.